Sweat drips off our faces as we peel our packs off to take a break for lunch. We’ve been hiking 3 hours already and are only halfway through the canyons. It’s 2 in the afternoon, and we still have to hike back up and begin our 3 mile trek to our backcountry campsite. I (Sara) look down at my water bottle with a frown. It’s almost empty. They said there would be a stream down here, running through the canyon floor which sits right atop the water table. ‘Stream was more of an exaggeration’, I think as I gulp down the last of my water and bend down to find a spot deep enough to fill my water bottle without it being completely sandy. Can you see the “stream” down by our feet? The so-called “stream” (pictured above) is a trickle of water running through the sand, not even high enough to get your feet wet as you cross it. I pick up my water bottle, thankful it’s opaque so I can’t see the sediments swirling around within. I drop an iodine tablet in and shake it up. Thank goodness we remembered to pick up purifying tablets on the way up, we would not feel comfortable drinking this water without a filter or some form of purification. The pigment of the rocks at Providence Canyon range from deep red all the way to white! Sara enjoying the view at Providence Canyon, Georgia. We made it to our camp around 6pm. Well, sorta anyways. We found a nice spot overlooking the canyon about a mile down the backcountry trail and decided to claim it. Now it was finally time to relax and enjoy the view! We felt like we were out west with all of the red rocks at Providence Canyon! Providence Canyon, known to the locals as the “Little Grand Canyon”, is located just outside the small town of Lumpkin, in southwest Georgia, just near the Alabama border. It’s home to the rare plum leaf azalea that is only found in the area and blooms in August. A lone tree in the middle of Providence Canyon, Georgia. Caused by poor farming practices in the 1800’s, the canyon is now a state park with hiking trails around and within its 9 canyons. We spent two days here, hiking and photographing the beautiful red and white sediments that make up this natural wander of Georgia. We hope you enjoy the pictures and as always, safe travels! Have you ever been to a canyon? If so, tell us about it in the comments section below! 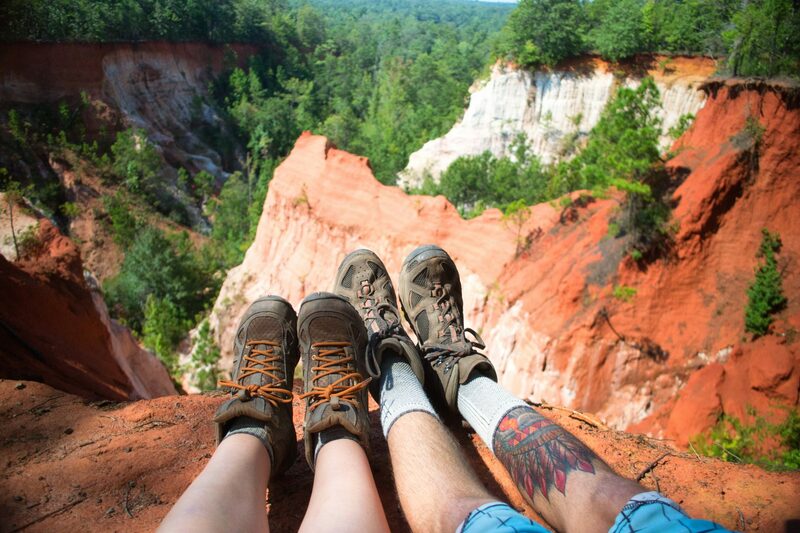 The red rocks of Providence Canyon appear to be straight out of the west!